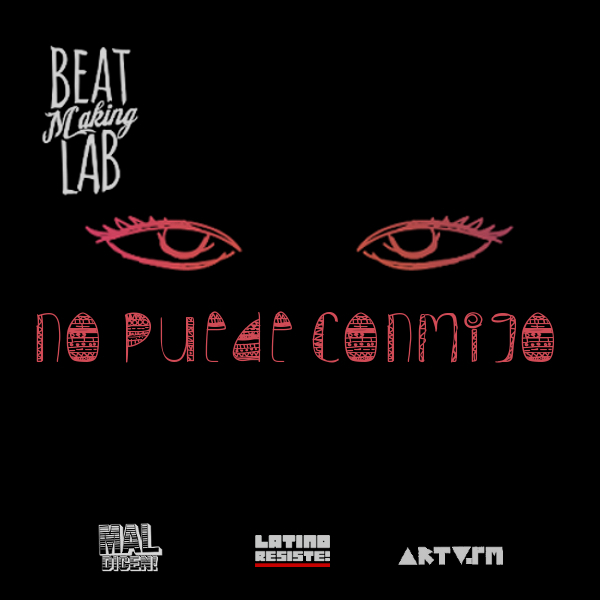 No Puede Conmigo is a free EP by Panama Beat Making Lab released by Mal Dicen x Latino Resiste x ARTVSM. The EP features beats, original songs and remixes inspired by the carnival festivals, youth and prisons of Panama. All original songs were recorded in Portobelo, in a community music-studio in where the set the Beat Making Lab up. The final result is a FREE ALBUM full of trap, moombahton, hip hop, latin-jazz and heavy bangers. PLUS a whole bunch of BONUS remix EP, made by some heavyweight producers. No Puede Conmigo also features Kulakostas and Tree City – the first and second-place winners of the Panama Beat Challenge. They were given the task of making a trap beat out of a sample a young Panamanian accordion prodigy named Martin. Beat Making Lab family/judges: Apple Juice Kid, Caballo and The 13th Tribe selected the top winners, who also received free SoundCloud Pro accounts. EP opens with a a great example of the collaborative nature of a Beat Making Lab. Producer Apple Juice Kid sampled Barrio Fino – a Panamanian comparsa band – and The Beast – a hip hop and jazz quartet from Durham, North Carolina – to make the beat. Guest vocalist Yomira John blessed the track with an her amazing voice and lyrics. Yomira’s recording session, which took place during a blackout in Portobelo, was turned into a music video. Video only used and Iphone light and a USB mic!!! great example you can achieve big things with mere talent! One more song that made this BML very unique is the addition of beatbox to moombahton!! The final OG track on No Puede Conmigo is a remix of RAM, or Rehabilitacion a Traves de la Musica (rehabilitation through music) – a beat created inside a prison by Apple Juice Kid and an incarcerated beat maker named Professor Angel Sound. To make the the beat, the duo sampled found sounds around the prison studio including a leaky faucet, clicking handcuffs and a guitar. The remix was produced by The 13th Tribe. Germany’s cumbia master, Andres Digital, also is present, with a cumbia-moombahton (cumbiathon) remix.